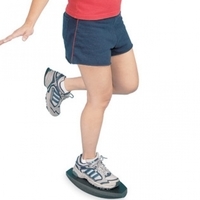 Cost-effective rehabilitation for the ankle, knee, hip and even the shoulder. This comprehensive rehabilitation device can be taken home so that patients may continue their rehab exercises between visits. Can be used for all stages of ankle, knee and shoulder rehabilitation, for sprains, ACL reconstruction, total hip replacement and scapular dyskinesis. Helps improve range of motion, strength, balance, core stabilization and proprioceptive awareness. Can be used for scapular stabilization activities. Exercises may be performed while supine, seated, or standing. Unique shape allows training in a triplanar motion so that the foot can accommodate even and uneven surfaces more easily, essential for return to full functional activities. Provides an excellent closed-chain regimen. Made of durable, cross-linked polyethylene foam for long-lasting use. Includes an easy-to-follow exercise sheet that allows the therapist to customize each patient's home exercise program. Flat side measures 13-3/8" (34cm) long.